John Eliot Gardiner’s inspired programming here combines Bach’s Actus Tragicus—Cantata 106—with the Easter Oratorio—but not in cover (or headnote) order. The exquisite and early (1708) Actus Tragicus is a funeral cantata for an unknown person. Gardiner’s note mentions two possible subjects, but both are speculative. 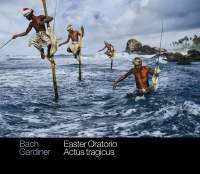 The Easter Oratorio, like many another Bach composition, underwent many metamorphoses. The final version, heard on the present recording, dates from the mid-1740s. Gardiner bemoans its relative neglect among Bach’s larger choral works. This recording could well correct the unfortunate situation. The cantata is through-composed but divided into two distinct parts, the first an Old Testament lament and the second a New Testament message of hope. Thus, Gardiner’s sequence moves from death through hope to resurrection. Following immediately after the cantata, the joy of resurrection bursts forth in the explosive energy of the oratorio’s opening Sinfonia. It prevails, with introspective diversions, to the end of the oratorio. The most notable diversion, the Adagio, is played masterfully here by oboist Michael Niesemann. Gardiner, of course, is at his best in projecting energy, but he can elicit introspection as well. His readings of the two pieces are well nigh ideal, The Monteverdi Choir, 23-strong in the oratorio but reduced to 12 for the cantata, is impeccable, and his solo quartet is superb from top to bottom. The venerable cantor, in his late 50s, was at the height of his powers when he put his final touches on the oratorio. The Actus Tragicus, composed in 1708, was one of Bach’s first and is one of his most memorable cantatas. Can we safely say that he had already achieved that exalted state at the tender age of 23? Highly recommended.